Centipede Shield - also a contest! > Centipede Shield - also a contest! 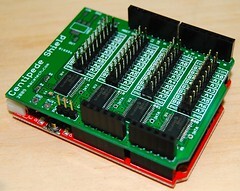 It provides 64 bidirectional I/O using I2C on analog 4 and 5...you can have 64 outputs, or 64 inputs, or any mix of the two. 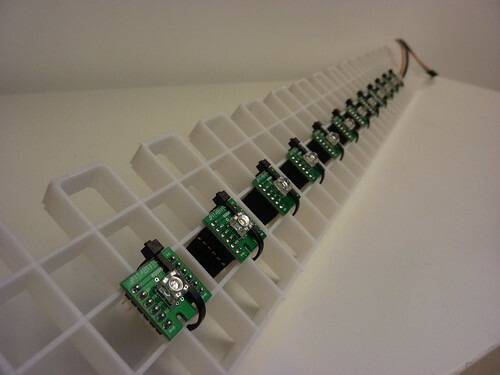 There are programmable pullups, bitmasks, and other functions. 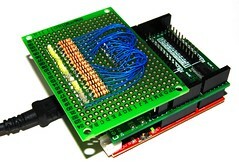 The I/O are wired to 2x10 headers, with a ground channel and a common channel that can be wired to a custom voltage. The chips themselves can also be switched over to an external power source. This might be necessary if the attached circuits will drain more power than the Arduino can supply. The funny thing is that while this board seems pretty useful, I don't have an immediate application for it. I can make a few more prototype shields, but probably won't want to sell those directly. However, here's an idea! If you have an existing, immediate use for this shield, please post your idea below by Friday, November 13th, 2009. I'll pick two ideas that I like, and contact the winners in PM to get a shipping address and send you a free Centipede Shield and operating instructions. I'll be looking for ideas that are exciting and/or very useful, are something you plan to build immediately, are described in excellent detail, exhibit your knowledge and ability to complete the project, are accompanied by any necessary diagrams, and written in a readable manner. If I get only one suitable entry by the 13th, I'll go ahead and announce that winner, and extend the contest by another week for the second shield. Feel free to spend time on your idea...this isn't a first-post contest. Any entry posted up to the 13th will be considered equally. Please keep the entire entry in this forum, not sent via private message, or written on another site and linked here. Thanks! Re: Centipede Shield - also a contest! What is the price of this going to be? Are you aware that you have competition already from the new MUXshield which also has lots of i/o pins (only 48 but when are you going to need 64?) and it is also stackable. 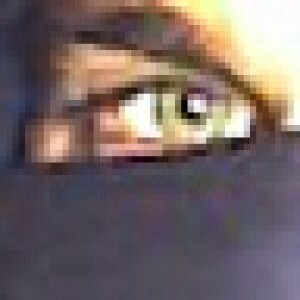 Why did you chose male instead of female headers? Is there a specific cable you can buy cheap for that size? I think that it would be good to have an option, so it can be used for quick prototyping or more permanent installation like yours would be best for at the moment. Haven't worked out pricing but aiming for the sub-$20 range. I saw the MUXshield pop up a while ago but didn't even really associate it with the Centipede Shield, they do totally different things. 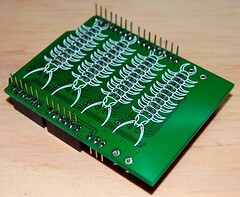 The Centipede Shield is just good old true bidirectional I/O while the MUXshield is...a MUX, not surprisingly. The Centipede Shield is useless for analog and in fact steals two of the Arduino's analog inputs, while the MUXshield is insanely useful for expanding the possible analog inputs. However the MUXshield is not too hot with digital I/O, since you can't just tell an output to be a certain value and have it stay at that level. The Centipede Shield is fire and forget, no multiplexing or strobing. It's more like a row of shift registers, except you can set input pins and software pullups and do interrupts on a pin change, etc. So you see the two shields are very different and will probably be used for different things, and therefore not "competition." I'm not planning to supply the shield with headers installed, but the plan is to use 2x10 IDC headers and ribbon cable to make it very easy to break out all the connections to external devices. I see, indeed they are completely different products and that pricing sounds good. So if I understand, you can set the number of pins you want as input and outputs, analog or digital? I mean like an Arduino pin? If yes, I would be interested (especially at that price!) ! Thats the limit of a mux, the 16 pins have all to have to be input or output. Because there are 3 chips you can have some input and some output and some analog/digital etc but you can't have all but 3 digital or something as I understand it. The Centipede Shield would be perfect for my project! I am trying to build a clock with two bi-color 8x8 led matrices. It doesn't seem very original, until I tell you that the matrix is covered with a black film with the shape of a letter on each led. The letters compose words and tell you the time in text. i could use this for my 8 legged freak (octopod robot) to add all the sensors i want for everything. Contact sensors for each of the 3 joints in all 8 legs. I'm working on making a robotic lawnmower to mow my lawn. It will require many sensors to navigate correctly without causing havoc. I think this will help me on my project to provide the input that will be needed. I have a project which I am currently working on, wherein it requires me to test a cable with 60 pins on either side for connectivity. The current process of testing involves 2 people using a multimeter to test each pin one after the other.The problem is , the wires within the cable can be broken at either end, or can be shorted on the same side to each other.I have already programmatically created about 2000 test cases for each side of the cable. I would imagine this could be a handy shield if you'd like to build a big led cube, maybe even using rgb LEDs. Though that would be a bit more tough to have a pwm like way to control the exact colors. I'm actually working on a project called the Anywhere Organ. The idea is to create a mobile, modular pipe organ that can stealthily be set up in any building/park/alley/office foyer turning the space into a giant musical instrument. I'm buying up old organ pipes off of ebay and was planning on using an arduino multiplexed to deliver outputs to the solenoid valves that deliver air to the pipes. Having access to 60 I/O pins would be incredible. Thanks for the reply. I understand that it is only digital, and that's ok like this! I'm working on a OSC-I2C "router" for creating easily OSC/MIDI interfaces. - Standard parts, just have some extensions the number you need and set them up via a DIP-Switches. 64 I/O? That would be... the standard extension for a 16 Pad matrix with RGB Leds! I'm developing some kind of musical instrument for a friend who sings in a band and now wants to play a "soundless" instrument. It uses twelve keys (push-buttons), each one lightens up a shiftbrite, and you can have as many keys pressed as you like. Also, there is a special button which allows to change the colour set, so with 13 buttons + 4 outputs for the Shiftbrite strip. A centipede shield would let me add more keys (another octave) and also control a couple of 7-segment displays to show the current scene. Also... it may be the push I need to add MIDI to the soundless instrument.